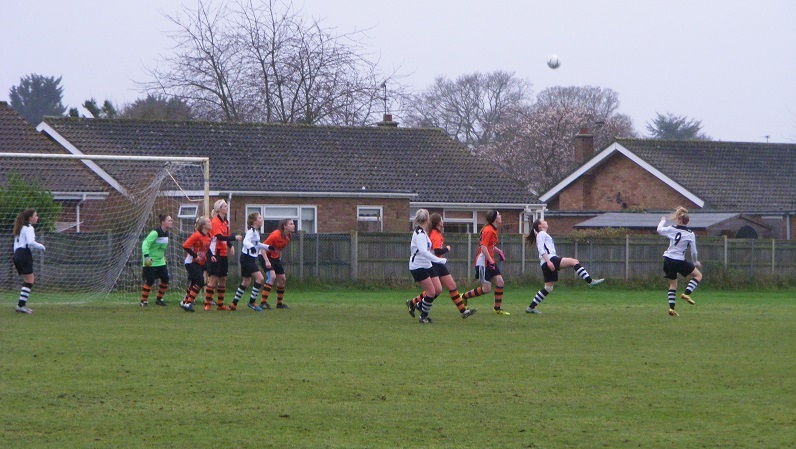 The women's football action on the Supporting Women's Football Blog this Sunday comes from Norfolk Women's Division Two with 2nd placed North Walsham Angels Ladies hosting 3rd placed Sprowston Ladies. North Walsham Angels Ladies along with Kirkley & Pakefield Ladies are the favourites to win one of the two promotion spots from the league as an influx of new sides at the start of the season in Norfolk saw the league set up go from two leagues to three this time around with 8 sides contesting Division Two. Kirkley & Pakefield Ladies are leading the way with a perfect 100% win record to start the season 6 from 6 played. North Walsham Angels Ladies lay 2nd having played 6 league games themselves, were matching Kirkley & Pakefield win for win up until their last league game dropping points in a 3-3 with bottom side Morley Ladies having started with just 10 on the field to go 3-1 up, injury put them down to 9 Morley taking advantage to win a points. Haven't seen as much football as they would have liked with their league cup 2nd Round match getting postponed twice has taken priority over upcoming league matches. Today North Walsham Angels Ladies have the chance to end 2015 unbeaten and with rivals Kirkley & Pakefield seeing their game called off an opportunity to retake top spot in the table. Looking up the table are also today's opponents Sprowston Ladies. Back in Division Two after getting relegated from Division One last season. Winning just one of their opening 4 league matches their season got off to a slow start, but whereas Kirkley & Pakefield and North Walsham Angels Ladies have seen postponements of late limiting their football, Sprowston Ladies have been able to get their games in have snuck up behind the leading pair following a run that has seen them win 4 league matches in a row to close the gap to North Walsham Angels Ladies to just a point, 3 behind Kirkley & Pakefield another 3 points today and they would be finishing 2015 in 2nd spot in Division Two. Have fielded 2 sides for the past 2 seasons with their Reserves competing in Division Three. Fixtures were falling by the wayside following a heavy band of rain that fell across the region on Saturday, several pitch inspections needing to take place. 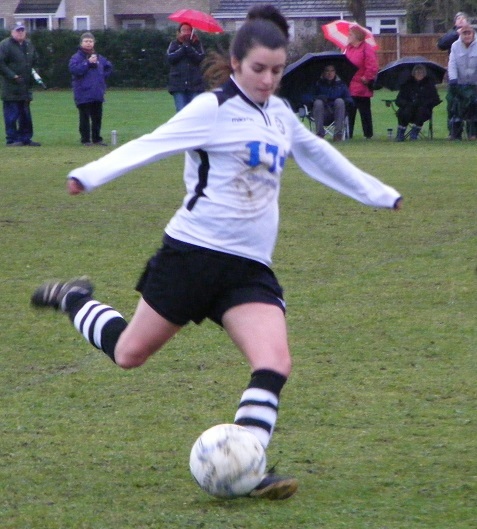 North Walsham Angels Ladies have been playing their home matches at the Millfield Recreation Ground, with that pitch looking too wet to host the match, the club switched to an alternative venue using the pitch at North Walsham High School. Had faired better with the wet weather, freshly cut the pitch having a slight slope from one goal mouth to the other had drained well, the weather and a recent mow made the pitch markings almost invisible to see, a test for those running the line today. Was still very damp outside a light drizzle falling very overcast over head a day when the brolly would be required. North Walsham Angels Ladies starting XI - Cyan Fullbrook, Emily Farmer, Sian Wager (C), Robyn Steele, Megan Champion, Sophie Hall, Amy Hemp, Imogen Carver, Rachel Bussey, Lauren Yarham & Luci Middleton. Sprowston Ladies starting XI - Lois Irving, Liz Johnson, Beth Cornwall, Erika Lakey, Belinda Downing, Rebecca Kirby, Darcey Fynn, Annika Skoog, Laura Jenkins, Shanice Sutton & MIllie Cursons. Both sides were short of players today with a few missing through injury for North Walsham they had just Emma Allsopp as their only named substitute. Sprowston arrived in the ground without any substitutes and now specialist goalkeeper. First team manager Lois Irving would be wearing the keepers gloves today. It's North Walsham to kick off the 1st half kitted out in white long sleeved shirts with black across the shoulders, black shorts and black and white hooped socks with Sprowston having the slope to their advantage 1st half lined up opposite wearing orange shirts with a black vertical strip down the right, black shorts and black and orange hooped socks. The drizzle steadily growing both sides look to play the long pass out to their wide left players early on, North Walsham's Lauren Yarham looks to take the ball down the line before cutting inside, Sprowston's Beth Cornwall steps out of defence to put the tackle in to end her run. Sprowston have 2 players operating in attack Shanice Sutton and Millie Cursons, bringing the ball up through the middle Darcey Fynn rolls the ball into Sutton pulling left as she advances sends the ball into Cursons making a run into the area from the right wins a corner for her side, put in from the right the ball is headed on across the six yard box at the near post catches everyone on their heels, no one attacks it. The ball is retrieved by North Walsham on the left set up a rapid counter attack the ball finding striker Luci Middleton, 20 yards out right of the area looks to strike the shot early, sends the ball wide of goal. Sprowston captain, Belinda Downing in the centre of defence does well to keep her eye on the ball as both Yarham and Imogen Carver find themselves the furthest forwards, central approaching the box Carver looks to pick out Yarham to her right, back pedalling Downing manages to intercept the pass preventing Yarham getting through on goal, the ball pushed out wide to the right is gathered by North Walsham's Rachel Bussey sends in an early cross towards the near post, Lois Irving has the angle covered claims the ball. Both Sutton and Cursons are willing to peel left and right into the channels run at the North Walsham back line, in the centre Annika Skoog sends the pass out to the left picked up by Sutton she makes a run, gets into a good crossing position whips the ball in towards the near post, North Walsham goalkeeper, Cyan Fullbrook gets down to make the save doesn't collect the ball pushing it out into space inside the six yard box, gets up and claims at the 2nd attempt as Cursons sniffs a chance. North Walsham built a attack down the right, captain Sian Wager rolling the ball up the line for Bussey in front of her, whips her cross into the box at a good height to attack, again near post 8 yards out Middleton rises to meet it, goes wide, but for a moment quite a few had thought it had gone in. Bussey on the right again doesn't get the cross into the box this time instead wins a corner kick. Middleton headers the ball on as it is sent into the near post again heading into the crowd beyond it's Skoog back helping defend who heads it clear. Is an end to end game Sprowston are very organised at the back a tall side defending deep offering little room to exploit round the back are dealing with North Walsham's attempts to cross the ball early. Amy Hemp playing in the centre of middle field brings the ball forwards looking to take on the Sprowston centre backs, Downing comes to meet her wins the tackle. Hemp then wins a corner her shot from 25 yards out hitting Downing and spinning behind for the set piece. North Walsham are rushing their passes getting frustrated by the organised Sprowston defence are giving it back to the visitors too easily allowing them to counter, play is flowing, North Walsham trying all sorts to find a way through. Carver plays a great pass through the centre into Middleton who gets in behind Downing right of goal, the centre back recovered quickly gets onto her shoulder snubs out the shot deflecting the ball behind for a corner. Put in from the right the corner comes into Hemp 8 yards out towards the near post turns hooking the ball towards goal, between them Irving and the defender covering the far post clear the ball off the line. Fullbrook is called into action to make a double save with play spread Sprowston breaking down the left with Sutton on the ball is looking to sweep her cross in towards the far post for Cursons, is in danger of going in Fullbrook needing to throw herself up to palm the ball away, North Walsham fail to get the ball clear the miscue falling to Fynn outside the D central takes on the shot doesn't get it wide enough of Fullbrook who gets down to make the save. The home side launch a counter attack up the left following a Sprowston free kick inside their half, Yarham winning a throw high on the left the ball is played through to Middleton just inside the box, hits the shot on the turn, on target it takes a deflection off a defender turning it wide for a corner. Put into the near post once again is only cleared to Robyn Steele up from the back on the edge of the area, she looks to drive into the area, commits a foul before getting her shot away. Hemp isn't afraid to strike the ball from distance, getting it from Carver shows good footwork to beat two players before playing it into Hemp 25 yards out central to goal hits the ball arrow straight, anything else and Irving might have been in trouble instead she is right behind the shot, still rising as it reaches her throws her gloves up tipping the shot over her crossbar. Another near post delivery Middleton has gotten in front of everyone can only turn her shot into the side netting. GOAL! 2 minutes of regular play left in the half and it's the visitors who break the deadlock, have bodies back to defend as North Walsham bring the ball up through the middle Sophie Hall threading her pass forwards into Carver she sprays play out to the right picking out Bussey. sends in the early cross too long to the far post is picked up by Rebecca Kirby bringing the ball forwards runs unchallenged to the half way line, then plays a perfect pass through the North Walsham defence into Sutton on the blind side of her marker, left of the goal bursting into the box, looks to hit the shot as Fullbrook rushes out to slide in put her off, the ball hits the keeper, deflected behind her, Sutton goes after it and sweeps the ball over the line into the back of the net 0-1. Late attacking from North Walsham, as Sprowston get plenty back to defend Yarham winning a corner on the left put into the near post, squeezes through everyone this time coming into Yarham behind six yards out with the turn and hit she's her shot blocked, Sprowston don't clear and North Walsham come again through the centre Middleton tries to force her way into the box her deflected shot behind for another corner, Hemp coming towards the ball at the near post she's her shot cleared off the line, the rebound falling to Carver who shoots and sees her effort cleared off the line too at the far post. Half-time and Sprowston Ladies have the advantage have defended well been organised an hard to bring down protected Irving in goal well, dropping deep at times conceding ground, have frustrated North Walsham who have had plenty of the ball wanting to attack quickly were caught out for the counter attack that led to the goal. A good contest so far but with no substitutes could Sprowston keep their defence solid for another 45 having made a few goal line clearances late on. Sprowston to kick off the 2nd half with North Walsham having the slope in their favour now. The home side are on the attack early on winning the ball back and taking it down the right the cross is turned behind for a corner kick. A new taker and tactic for the 2nd half instead of putting the ball in to the near post instead it it swept out to the back of the area, falls to the feet of Steele inside the D, she hits her shot with plenty behind the ball, Cornwall puts her body on the line to make the block the ball spinning out to the left is picked up by Emily Farmer, sending the ball back into the area comes through to Carver wide of the far post six yards out looks to shoot across goal, Irving coming towards her near post gets enough of her glove on the ball to send it wide out the far side for a corner on the left. GOAL! Not even 5 minutes into the 2nd half and North Walsham pull the scores level, from the corner kick on the left, players cueing up on the edge of the area to attack the ball as it comes over is met by Middleton who turns the ball towards goal, the player defending the near post can't get her head on the ball to turn it wide as the ball goes over her to nestle into the back of the net 1-1. Sprowston look to get up the other end straight away Sutton and Cursons isolating Megan Champion at the back as the they attack through the middle Sutton tires to pick out Sutton, Champion doing what Downing did 1st half stepping up to intercept the pass, send it forwards wide right for Bussey who wins a throw deep in the half. GOAL! Kirby playing wide on the right for Sprowston is effective going forwards and North Walsham make the mistake of sitting off her as she brings it over half way right side of the area takes 3 more touches 20 yards or more out goes for the shoot, hits it perfectly, a screamer sending it flashing across Fullbrook before she can react into the far corner of the net 1-2. Irving saves with her feet clearing the ball off the line following a 20 yard effort from Middleton peeling right off her marker as Hemp plays her in the cleared ball comes back to Hemp outside the D however she is falling back as she tries the shot taking away any power allowing Irving to gather. Sprowston are defending deep with the midfield pulled back too, Sutton and Cursons aren't seeing much of the ball. When Sutton gets a chance to run after it on the right the best she can do is win a throw. GOAL! From the throw North Walsham go down the other end of the pitch and equalize the 2nd time in the match. 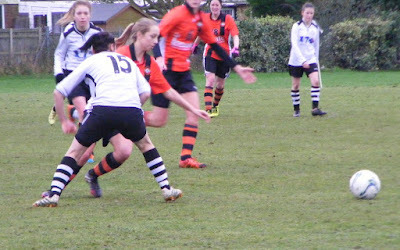 As direct as you like the throw is put into the feet of Hemp she turns and brings it forwards plays it through the middle, cutting open the Sprowston defence with Middleton latching onto it, strong running taking her into the box, Irving comes, Middleton shoots gets the ball past her and scores 2-2. Wager and Bussey combine on the right the full back able to get forwards more sends Bussey in down the line she squares her cross into the box got height for a header it's Erika Lakey who jumps to head the ball behind for a corner kick. The set piece fired in from the right is flicked behind by Middleton as she comes towards the ball near side of the box. Bringing the ball out from left back Farmer opens up her body to launch the ball into the box a good deliver Irving does well to keep her eye on it and claim with Middleton bearing down on her. Light is fading fast very gloomy overhead with a little less than 20 minutes to play. Fullbrook has a very good kick on her can clear the opposition defence give her strikers a chance to attack the ball, Middleton has Carver up with her plays the ball on for the midfielder, who shifts the ball well between her feet to open up the shot, Irving seeing it late saves with her feet deflecting the ball wide at her near post for another corner. Sprowston are forced to finish with 10 on the field as Fynn can't continue, no substitutes to bring on Sutton drops back into midfield. Sprowston are defending a corner on the right, Bussey to put the ball into the box, Downing rises to head away the ball rolling back out to Bussey, has Steele available on the edge of the box lays the ball into her feet, doesn't get the connection with the ball she wanted the shot rolling harmlessly through to Irving. North Walsham very nearly give Sprowston the lead, an advantage is played off a handball on halfway Sutton has the ball at her feet looks to send Cursons away through the centre. Farmer gets to the ball 1st 20 yards out looks to clear it facing her goal sends the ball a yard wide of the post for a corner on the left. The ball is fizzed into the near post squirms through the crowd catching Fullbrook by surprise as she goes down to save turns it into the centre of the six yard box, Cornwall is there, can't dig the ball out of her feet to get the shot away quick enough as Fullbrook scrambles across the ground to smother the ball. GOAL! Out of nothing North Walsham take the lead for the 1st time in the match a shot out of nothing possession on the right the ball is laid back to Hemp in the centre of the half a long way out goes for goal lifting the ball high into the air, is a very grey sky picking out a white ball is going to be tough. The flight of the ball is perfect even back on her line Irving can't stop the shot as it drops under the bar and into the back of the net 3-2. It's all North Walsham late on Hall plays an inch perfect pass through to Middleton moving out to the right, driving into the box wide of goal flashes a cross chest height along the six yard box with both Yarham and Carver racing to get onto the end of it neither can get the needed touch to turn it home. Lakey makes the block to stop a Middleton shot from inside the area taking enough power out of the ball as it runs through for Irving to pick up. Sutton manages to steal the ball from the North Walsham midfield late on has Skoog up in an advanced position takes on the shot from outside the D however Fullbrook can see it roll wide of her goal. Closing seconds and Middleton is through into the box right side of goal looks to shoot across the keeper, leaving her stranded, her hat-trick isn't to be as the ball comes back off the post and is cleared. Almost dark now and the final whistle blows North Walsham coming back from a goal down at the break to win the match 4-2 and move back to top of the league table going into Christmas. Had to be patient for the win Sprowston proving to be a hard side to break down and clear to see where there recent run of good form has come from, ended today but lots of positives lack of subs at the end making it difficult for tiring legs to deal with North Walsham as they found the extra bit of quality to retain the ball and win the match. The Norfolk League breaks now for the best part of a month a good rest, plenty of time to get that Christmas shopping done. My thanks to both clubs for their help with the teams today.